The Russian annexation of the Crimea, the Russian-backed armed rebellion in the eastern part of the country and the enormous flood of refugees form an acute menace to Ukraine’s stability. The same can be said of the spreading corruption and the absence of an independent judiciary, and the fact that as things stand the country is virtually bankrupt. Europe can’t just look away and must show solidarity.’ So said Dutch Senator Tiny Kox, chairperson of the Unified European Left Group during a working visit to Kiev with the Presidential Committee of the Parliamentary Assembly of the Council of Europe. 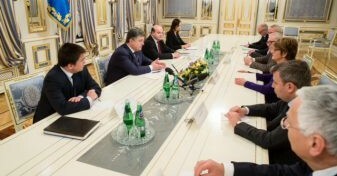 In Kiev the Presidential Committee spoke with the president, prime minister and parliament of the unstable country. ‘President Poroshenko is in an unenviable position,’ says Kox, ‘as I told him during our meeting in Kiev. His country, as a member state of the Council of Europe, deserves every support in sorting out the enormous chaos and with the implementation of the agreements designed to put a peaceful end to the armed rebellion in the east and the illegal Russian interference there. Poroshenko recognises the need for far-reaching reforms. He stresses also that there is no military solution to the conflict in his country’s east, a conflict which has already cost five thousand people their lives, a figure which includes two hundred Dutch passengers on flight MH17. Ukrainian premier Arseniy Yatsenyuk, on the other hand, did not rule out a military solution, he told us,’ Kox added. ‘Both Poroshenko and Yatsenyuk are supported by large political groups in the new parliament, and together these two groups along with a few other parties can command a large majority. But if the biggest groups fall out, the government will quickly become unstable. This week we saw such a dispute in the Verkovna Rada, over a proposed law aimed at reducing the power of the oligarchs. Poroshenko’s party is in favour, Yatsenyuk’s against. And recriminations were being repeatedly chucked about when it came to who would tackle the scandalous power of big money in Ukrainian society. Meanwhile the opposition is complaining to us that parliamentary rights are being undermined by the majority. There is certainly agreement amongst Ukrainian politicians over the need to put an immediate end to neighbouring Russia’s meddling in their country. ‘While the Russians continue to say that this is an internal struggle, which is going on without them, the president told us that he has proof of the presence of nine thousand Russian soldiers with five hundred tanks. If Russia were to withdraw these troops and tanks and close the border, according to Poroshenko there would be a sustainable cease-fire within two weeks. He would then grant a special status to the rebellious areas in the east and introduce an amnesty law for the insurgents. The international community should therefore continue to exert pressure on President Putin to respect Ukraine’s territorial integrity. That’s what almost every politician whom we have met in the past few days of intensive talks in Kiev has been saying. Kox notes that ‘according to the Ukrainian president there is still some prospect of a summit meeting at the end of this month between himself and Putin, Merkel and Hollande. But for that Russia has to change its ways, he says. The Russian government does not accept that Ukraine is doing all that it can to maintain a ceasefire, while the recent parliamentary decision to put an end to Ukraine’s neutral status did not go down well with Moscow, where it was seen as a step towards NATO membership. The controversial Association Agreement with the EU is considered as heralding actual Ukrainian EU membership. Russia says that the advance of NATO and the EU is a dangerous business and that it contravenes previous agreements. At the end of this month the Parliamentary Assembly of the Council of Europe will decide whether the Russian parliament can continue to participate in this international parliamentary forum. ‘I told them in Ukraine that I would rather have the Russians inside, so that I can talk to them about what their government is doing that’s wrong, than throw them out and have them cut off from our criticisms,’ says Kox. ‘Moreover, we should not in times of crisis close any doors but, on the contrary, keep them open to parliamentary diplomacy’.